MLB Postseason Schedule 2017 With Some Interesting Tweeks. Major League Baseball released the 2017 postseason schedule on Tuesday — and it is similar to last year’s, except in one important way: The 113th World Series will begin Oct. 24 on FOX at the home of the league champion with the better regular-season record. The standard playoff tiebreaker rules will apply should the two pennant winners finish with identical regular-season records. First is head-to-head winning percentage during the regular season, then higher winning percentage in intradivision games. Gone are the days when World Series home-field advantage went to the league that won that year’s All-Star Game. It resulted in fun times in Miami at the Midsummer Classic, and now it means hypothetical fun and unrelenting focus on divisional opponents. If anything, the new World Series home-field rule, a byproduct of the latest collective bargaining agreement between MLB and the MLB Players Association, adds even greater incentive for runaway division leaders like the Dodgers and Astros to keep pressing the gas pedal through September and leave no key tiebreaker scenario exposed. Let’s just say those two teams, which each has the best record in its respective league, zoom through the postseason and meet in Game 1 of the World Series. As of now, the Series would open at Dodger Stadium. But the Dodgers and Astros have no Interleague meetings in 2017, and that means that if they finish with identical regular-season records and meet in the Fall Classic, Game 1 would be at Minute Maid Park, because Houston has a better intradivision record. Now let’s say it’s a rematch of the historic 2016 World Series, which the Cubs clinched in Game 7 despite the Indians’ home-field advantage. Cubs fans would have loved those four home games instead of three, right? Cleveland (59-50) currently has a slight lead over Chicago (59-52), but they have no Interleague head-to-head meetings in 2017, so a tiebreaker would go to intradivision records. Right now, the Cubs would have that tiebreaker by a slight margin. Until 2003, World Series home field alternated back and forth between leagues. There have been 90 World Series under the 2-3-2 format, and in only 46 of them did the team with the better regular-season record have the home-field edge. For fans hoping for a Dodgers-Astros matchup in late October, note that since 1999, the only time the teams with the best record in each league met in a World Series was 2013 (Red Sox over Cardinals). It’s a rarity. The regular season will conclude again with all 15 games played concurrently starting at 3:05 p.m. ET on Sunday, Oct. 1. Then any potentially necessary regular-season tiebreaker games would be telecast exclusively by ESPN on Monday, Oct. 2. The American League Wild Card Game will be on ESPN on Tuesday, Oct. 3, followed a day later by the National League Wild Card Game, televised exclusively by TBS. Both AL Division Series will be scheduled to begin on Thursday, Oct. 5. The first full slate of Division Series games, featuring two NLDS openers and a pair of ALDS Game 2 contests, will be held on Friday, Oct. 6. Overall, the Division Series are scheduled to run from Thursday, Oct. 5, through the following Thursday, Oct. 12, with potential Game 5s on Wednesday, Oct. 11 (ALDS) and Thursday, Oct. 12 (NLDS). TBS will cover all NLDS games, while FS1 or MLB Network will cover the ALDS. The AL Championship Series, beginning on Friday, Oct. 13, will be telecast by FOX or FS1. The NLCS, set to start on Saturday, Oct. 14, will be telecast by TBS. A potential Game 7 of the ALCS is scheduled for Saturday, Oct. 21, while a potential Game 7 of the NLCS is set for Sunday, Oct. 22. Game 1 of the 2017 World Series is scheduled for Tuesday, Oct. 24, and the best-of-seven series will change sites for Game 3 on Friday, Oct. 27. If a Game 7 proves necessary once again, it is scheduled for Wednesday, Nov. 1. Scheduled days off are Oct. 26 and 30 (if a Game 6 is necessary). FOX Sports will present live telecast coverage of the World Series for the 20th time. Since the Wild Card Game was instituted in 2012, the annual total of actual postseason games played was 32 in ’12, 38 in ’13, 32 in ’14, 36 in ’15 and 35 in ’16. All postseason games telecast on MLB Network, TBS, FS1 and FOX will be available to MLB.TV subscribers who are authenticated subscribers to the applicable network through a participating pay TV provider. ESPN Radio will provide live national coverage of all 2017 postseason games, including the Wild Card Games and any necessary tiebreakers. MLB.com will have full coverage of all postseason action. Mark Newman is enterprise editor of MLB.com and a baseball writer since 1990. Follow him @Marathoner and read and join other baseball fans on his MLB.com/blogs hub. This story was not subject to the approval of Major League Baseball or its clubs. MLB Homerun Record About to Fall. NEW YORK (AP) — Giancarlo Stanton’s smacks, Aaron Judge’s jolts and all those dizzying long balls helped Major League Baseball move another poke closer to the inevitable. Nearly two decades after the height of the Steroids Era, the sport is on track to break its season record for home runs on Tuesday — and not just top the old mark, but smash it like one of those upper-deck shots that have become commonplace in the Summer of the Slugger. There were 5,677 home runs hit through Monday, 16 shy of the record set in 2000. Juiced balls? Watered-down pitching? Stanton’s renaissance? Sensational starts by Judge and Cody Bellinger? There were 5,610 homers last year, an average of 2.31 per game, and this year’s average of 2.53 projects to 6,139. That would be up 47 percent from 4,186 in 2014. In just three years, home runs will have increased by 1,953 — an extra 149 miles of long balls at this year’s average home run length of 400 feet, or 15 miles more than the driving distance between Philadelphia’s Citizen’s Bank Park and Washington’s Nationals Park. 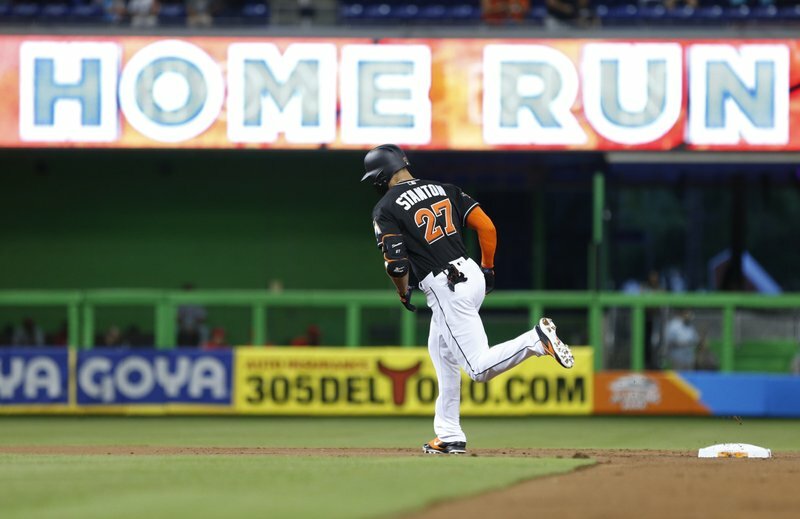 Already 108 players have hit 20 homers this year, just two shy of the record set last season — and up from 64 in 2015, according to the Elias Sports Bureau. “The ball seems to soar from people that are hitting it farther than maybe they did a year ago … and they kind of look like the same person,” Minnesota manager Paul Molitor, a Hall of Famer hitter, said before Monday night’s game at Yankee Stadium. Along with sailing shots come strikeouts, which will set a record for the 10th consecutive year. There were 37,083 whiffs through Monday, an average of 8.25 per team per game that translates to 40,103 over the full season. Baseball officials are worried about decreasing action and have been alarmed by the strikeout rise. This year’s total is up from 38,982 last year and headed to an increase of nearly 8,000 from the 32,189 in 2007. The strikeout spike coincides with a rise in fastball velocity; four-seamers have averaged 93.2 mph this year, up from 91.9 mph in 2008, according to MLB data. Jackson set a record with 2,597 career strikeouts, maxing at 171 in 1968. Six players already have reached 171 this year, led by the Yankees’ Judge at 198. He could break Mark Reynolds’ season record of 223, set in 2009. Steroids fueled the home run surge in the late 1990s and early 2000s, and power subsided after the start of drug testing with penalties in 2004. The home run average dropped in 2014 to its lowest level since 1992, then started rising during the second half of the 2015 season. MLB has the UMass-Lowell’s Baseball Research Center conduct periodic testing of baseballs and University of Illinois physics professor emeritus Alan Nathan consults as part of quality control. The sport has said repeatedly that baseballs fall within the specifications in the rules. Manfred isn’t worried some undetectable substance is fueling the new rise. Women Have More Muscle Stamina Than Men. This article means that the practice of having women play shorter matches in tennis tournaments is based on false science. The practice is to have women play best of three sets and men play best of five sets. This practice should end. Women have more stamina and muscle endurance than men, study suggests. Women have greater muscle endurance than men, a study appears to show. 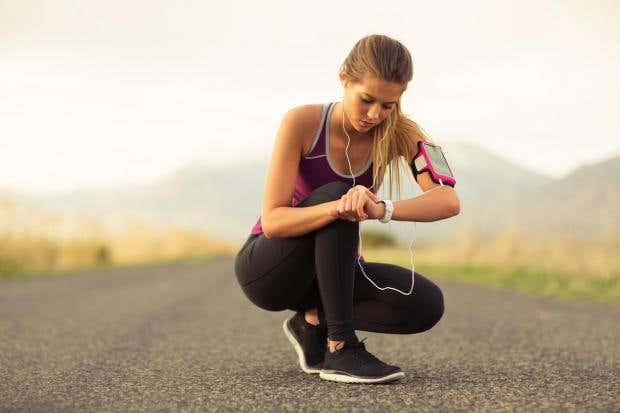 Researchers from the University of British Columbia found women were less tired after natural muscle exercises than men of a similar age and athletic ability. For the study, nine women and eight men were asked to flex their foot against a series of sensors as quickly as they could 200 times. The speed, power and torque – rotational force – of their movements and electrical activity of their muscles was recorded. The results showed men were faster and more powerful at first, but became more exhausted much faster than the women. Professor Brian Dalton, study author, said: “We’ve known for some time that women are less fatigable than men during isometric muscle tests – static exercises where joints don’t move, such as holding a weight – but we wanted to find out if that’s true during more dynamic and practical everyday movements. The researchers measured foot movements because it makes use of calf muscles on the back of the leg, used for everyday actions such as standing or walking. Although only one muscle group was studied, Professor Dalton said he would expect similar results for others. “We know from previous research that for events like ultra-trail running, males may complete them faster but females are considerably less tired by the end,” he explained. The study, carried out in collaboration with the University of Guelph and University of Oregon, was published in the journal Applied Physiology, Nutrition and Metabolism. Germany is making trouble again. This time it is not sending young men in uniform swarming across its borders to conquer Europe. Instead, it is using its position of economic dominance to cause young Muslim men from outside Europe to swarm across Europe’s borders. In World War II, Germany’s conquest of Europe and subsequent defeat left the continent in ruins. This time, however, Germany’s actions seem designed to bring about Europe’s destruction by inviting conquest rather than by initiating it. First the Kaiser, then Hitler, now Angela Merkel. Over and over again and in different ways, Germany’s hubris has invented ways to take Europe down. How can we possibly be here again? If you take a moment to ponder the title of Gertrude Himmelfarb’s book, The Roads to Modernity: The British, French, and American Enlightenments, you will notice that Germany is conspicuously absent from Himmelfarb’s subtitle and her book. This is an important clue about the shape of the West today. After all, the story of Germany comes close to defining the conflicts and agonies of the 20th century and gives clues about our present crises. It is a remarkable fact that twice in the 20th century Germany fought the three nations in Himmelfarb’s list in two enormously destructive wars. Those conflicts strongly suggest that Germany was the enemy, not just of those nation states, but also of the Enlightenment traditions those nations represent. The Enlightenment was a period of political revolutions in Britain, America, and France. Those revolutions resulted from a radical change in thinking in those three countries. Britain’s revolution came first, in 1688. It replaced the divine right of kings with rule by the king (or queen) in Parliament, a regime that is still recognizable in Britain today. The radically new American idea was forged in the American Enlightenment and recognizes the sovereignty of the people (the subject of my book, Common Sense Nation: Unlocking the Forgotten Power of the American Idea). America’s original constitutional design is also still recognizable, though America in recent years has been living under an increasingly post-constitutional regime. France keeps trying to make its version of the Enlightenment project work politically, reflecting its inherent problems. France’s current attempt, the Fifth Republic, was established only very recently, in 1958. Anglo-American culture and German culture split decisively from each other, one following a broadly Enlightenment program, the other a Counter-Enlightenment one. How would the 20th century have played out if Germany had belonged in Himmelfarb’s subtitle such that war between a 20th century France and Germany would have been as unlikely as war between 20th century France and Britain? That, it seems, would have averted both world wars and saved lives by the tens of millions. Instead of being part of the Enlightenment project, Germany was the heartland of Romanticism, the 19th-century movement that followed the Enlightenment era. Romanticism was the rejection of Enlightenment thinking, and it started in Germany. …common sense, moderation, was very far from their thoughts…there was a great turning towards emotionalism…an outbreak of craving for the infinite…admiration of wild genius, outlaws, heroes, aestheticism, self-destruction. The Germans emerged from the Enlightenment era as the counter-Enlightenment people. Why “satanic”? Berlin’s description of the romantic hero evokes the figure of Satan. Satan’s sin is pride. Propelled by a feeling of injured pride, he led a rebellion against Heaven. It also describes Hitler. He stirred up the Germans’ injured pride over their defeat in World War I, and led Germany into a war of unimaginable destructiveness which ended with the destruction of Germany and Hitler’s suicide. Once again, the Germans while seeking to salve a wounded pride through self-destructive means, seem poised to take the rest of Europe down with them. For about a century after the Germans set out on their anti-Enlightenment path, the threat they posed to the West was limited because Germany did not exist as a single country. Before 1871, the area that would become Germany in that year consisted of a number of independent states varying in size and power, ranging from kingdoms and grand duchies to principalities, cities and ecclesiastical states. Although the number of German states had declined throughout the centuries, reduced by deaths of royal lines, annexation, and conquest, there were still around 300 German states by 1800. The new state, by unifying the Germans, soon acquired the power to threaten the West. When the Allies divided Germany after its defeat in World War II, it was again no threat–though certainly an unhappy place for those stuck living in the Eastern part of the divide. Now reunited, it is no coincidence that Germany is a problem again. It is important to realize how much the Germans’ rejection of Enlightenment thinking, already strong, was intensified by their experience of the Napoleonic Wars. Napoleon ravaged and humiliated the German states. For Germans, Napoleon represented not just the French Enlightenment, but the Enlightenment overall. The Germans hated Napoleonic France and rejected the Enlightenment along with it. The emergence of the United States, modern Britain, and modern France during the Enlightenment era, and Germany’s rejection of the Enlightenment provide the basis for understanding why Germany has been and continues to be a problem for the West. If the West wishes to avoid a repetition of the destruction and disasters of the last century, it would do well to consult its own Enlightenment tradition and to marginalize the thinking of German Romantics, like Merkel, who recall an intellectual tradition that can demonstrate no positive historical achievement. Robert Curry serves on the Board of Directors of the Claremont Institute and is the author of Common Sense Nation: Unlocking the Forgotten Power of the American Idea from Encounter Books. You can preview the book at: http://www.amazon.com/Common-Sense-Nation-Unlocking-Forgotten/dp/1594038252 He also serves on the Board of Distinguished Advisors for the Ronald Reagan Center for Freedom and Understanding. In this article, George WIll describes the football brain injury problem in detail. The conclusion is that such injury, even minor injury, is inevitable for professional and college players due to the number of hits and the size of the players.